Queensrÿche's highest-selling album gets the deluxe reissue treatment two decades after its release. By the end of the 1980s, Queensrÿche was a highly regarded band in the heavy metal world, the direct result of a lot of touring and a willingness to experiment in the recording studio in ways that few young bands at the time had the guts -- and label support -- to do. After starting out as a very good New Wave of British Heavy Metal knock-off, the Seattle quintet got bolder and bolder with each subsequent record, maturing by leaps and bounds every time. The 1984 debut full-length The Warning brought theatricality to Queensrÿche's traditional metal style, predating such contemporary subgenres as progressive metal, symphonic metal, and power metal. 1986's woefully underrated Rage for Order was a daring blend of classy, high-gloss pop and unconventional song structures, while 1988's masterpiece Operation: Mindcrime was a landmark album in American metal, the best rock opera since Pink Floyd's The Wall. After such a strong run, the group had all the credibility in the world, but Queensrÿche was still spending the majority of its touring schedules opening for bigger bands. With Mindcrime singles "I Don't Believe in Love" and "Eyes of a Stranger" actually faring relatively well on the U.S. charts, mainstream success was within Queensrÿche's grasp, but, if the band wanted to broaden its audience, it would have to find more of a middle ground between middle-of-the-road hard rock and progressive-minded metal. Its fourth album, 1990's Empire, attempted just that, and the gamble paid off immensely, to the tune of three million copies sold and no fewer than six Top 30 singles, including an unforeseen smash that catapulted Queensrÿche to stardom. Twenty years later, that breakthrough record has been given the reissue treatment, appended with various bells and whistles, while offering audiences another chance to listen to what some consider the band's career-defining album. As singles-heavy as it was, Empire remains somewhat of an enigma. It's beautifully produced and features some of the band's quintessential songs, but at the same time it's a rather bloated, conceptually scattershot piece of work containing filler that honestly has not aged very well. First, the good, of which there is no shortage of: Keyboard-laden and streamlined like songs Rush was doing at the time, "Best I Can" is not only an energetic opener, but a very effective beating-the-odds anthem that avoids the usual clichés. The horn synth blasts on "The Thin Line" are wince-inducing, but the rest of the song exudes a similar paranoia as Rage for Order's best moments, thanks largely to singer Geoff Tate's restrained performance. "Jet City Woman" is an inspired single, a straight-ahead hard rocker that overcomes the band's oddly effeminate backing vocals (a strange let-down after a masterful, ascending pre-chorus), while "Anybody Listening?" has aged beautifully, a moody ballad that has Tate waxing philosophical without coming off as pretentious. The album's three best songs are easy to pinpoint. The title track is unlike any other on the rest of the record, a dark, brooding melodic metal piece that has a lot in common musically and structurally with tracks from Mindcrime, with Tate delivering vivid character sketches that depict American culture in decline. In direct contrast is "Another Rainy Night", a drop-dead gorgeous love song in the vein of Rage for Order's "Walk in the Shadows". Written by guitarist Chris DeGarmo, the band's best songwriter, the track is laced with classy twin guitar harmonies reminiscent of Scorpions and a crescendo that builds tension before a flourish of rich backing vocals. Then there's "Silent Lucidity", a ballad of DeGarmo's that brazenly shows its love of Pink Floyd's "Comfortably Numb", yet manages to fit perfectly within the Queensrÿche sound. The late Michael Kamen, who was no stranger to bombastic scores, provides some of his finest orchestration on record, helping the track build to a sweeping, heartbreaking climax as Tate, through DeGarmo's lyrics, muses about lucid dreaming. Sadly, the song has been lumped with other pop metal power ballads of the time, but "Silent Lucidity" is far too smart, thoughtful, and restrained to warrant such pigeonholing. The rest of Empire, however, is frustratingly uneven. Bassist Eddie Jackson's lightly funky bassline on the maudlin "Della Brown" is a horrible attempt at an "urban" sound. "Resistance" attempts to be a rallying cry as past songs like "Chemical Youth" and "Revolution Calling", but falls flat. "Hand on Heart" and "One and Only" bear DeGarmo's trademarks, from their gentle pop melodies to the sharp, melodic riffs, but compared to past love songs (and high point "Another Rainy Night"), they feel like lower-tier tracks. When a songwriter uses lines like, "Won't you come and show me that precious smile / And maybe stay for a little while," he's scraping the bottom of the barrel. The better songs don't go unscathed, either, as far too often the band and producer Peter Collins add little conceptual pieces in between songs. Do we really need the dialogue at the beginning of "Best I Can"? And is there a point to the sound bites linking "Della Brown", "Another Rainy Night", and "Empire"? Interestingly, if there's one thing the bonus live CD proves, it's just how much more powerful Queensrÿche's early-'80s material sounds compared to the polished Empire. Recorded in November 1990 at London's Hammersmith Odeon, the ten songs focus primarily on Empire, showing how the band relied far too heavily on backing tracks to enhance the performance. 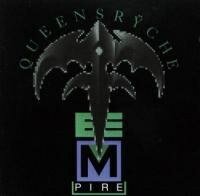 However, when it launches into classics from The Warning like "Roads to Madness" and "Take Hold of the Flame", Queensrÿche sounds incendiary, Tate's multi-octave voice going all-out, DeGarmo and fellow guitarist Michael Wilton taut and flashy, drummer Scott Rockenfield a force on his massive kit. Queensrÿche was a thrilling live band in the 1980s mainly because it was just the five of them showcasing their tremendous chemistry. By the time the arrangements got more and more lavish, the live shows definitely suffered. In the end, the question of whether or not this reissue is worth purchasing depends on the individual. The album disc is exactly the same as the 2003 remaster, including the same bonus tracks (the less said about the abysmal cover of "Scarborough Fair", the better). The live CD isn't the best recording at about soundboard quality, if that, but it's an interesting snapshot of the band when its popularity was at an all-time high. The art design has enough frills to please the collectors out there, so it's not a total waste; the band has done a nice job putting a package together for its fans. If you have fond memories of Empire, you'll likely get a kick out of this new version. For some of us who obsessed over the band in the 1980s, though, the record still feels like the moment our own little secret slipped away and became part of the zeitgeist. It's a trite and selfish thing to say, absolutely, but there's no denying that after the ambitious yet inconsistent Empire, Queensrÿche was never the same band again.